Salesforce.com has expanded the number of mobile application development tools it supports and also created a series of templates aimed at helping coders create mobile applications faster. The focus of the 20 open-source HTML5 and CSS-based templates is on exploiting "micro-moments," or the many brief periods of interaction people have with their mobile devices each day, said Adam Seligman, vice president of developer relations, Salesforce.com platform. Salesforce.com got the idea for the templates, which cover narrow scenarios such as an inventory check or appointments, through feedback from developers during a 40-city tour it conducted recently, Seligman said. "The thing our developers are trying to do is not take massive, legacy applications and make them available in the cloud," Seligman said. "They're trying to get to what their customer wants to do," namely "super-fast," relevant and contextual business activities, he added. Salesforce.com has gone even further than the templates, with a new "gallery" of sample mobile applications, which are also available now. The mobile application world is fragmented, with many developers already having a favorite development framework. 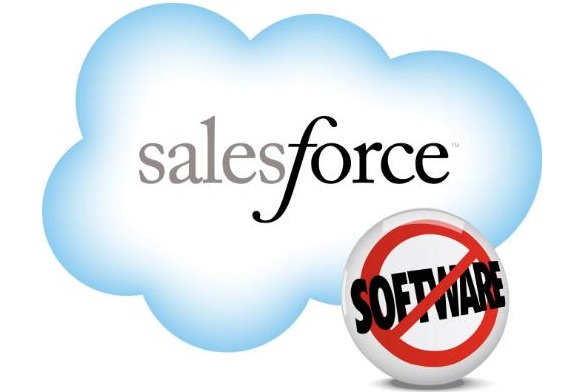 Salesforce.com's strategy is to embrace the situation rather than attempt to hem developers into a single homegrown toolset, although it has also developed one itself. On Tuesday, it announced API support for four additional frameworks, including Knockout.js, Appery.io, Sencha Touch and Xamarin. The last is aimed at Microsoft .NET developers and is based on Mono, the open-source implementation of .NET. Salesforce.com's own mobile SDK is also getting an update, with a main new feature called SmartSync, which allows developers to create applications that work with data both off and online. While Salesforce.com eventually hopes to generate significant revenue through mobile applications, it's taking the open-source approach now in order to seed the market. "We have developers building apps fast and furious for the platform, and we want make them super, super successful," Seligman said.